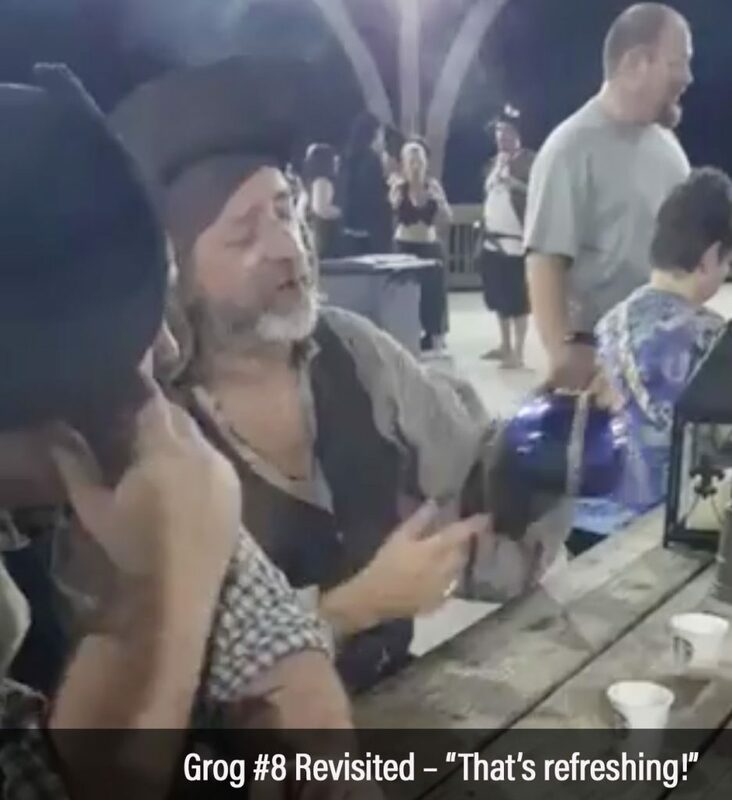 Bon Vivant and recent dance-off loser Billy Bones returned to Tybee Island, Georgia, last weekend to host the 3rd edition of his wildly popular grog competition on the occasion of the 14th Annual Tybee Island Pirate Festival. 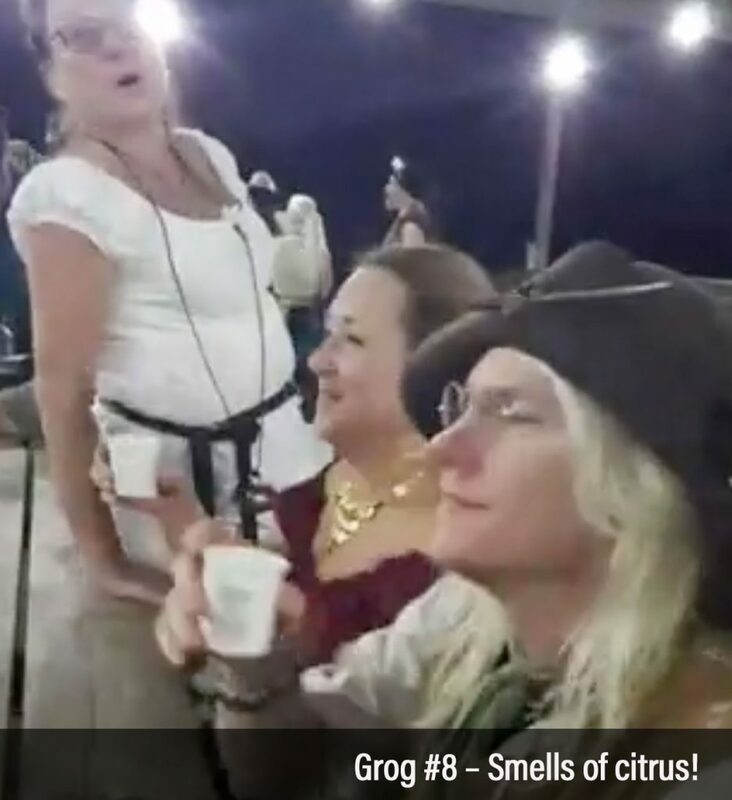 This year Billy’s event took place at the Tybee Beach Pier & Pavilion, to the sound of crashing waves and the shriek of deranged nightgulls circling the crowd of drunken pirates. 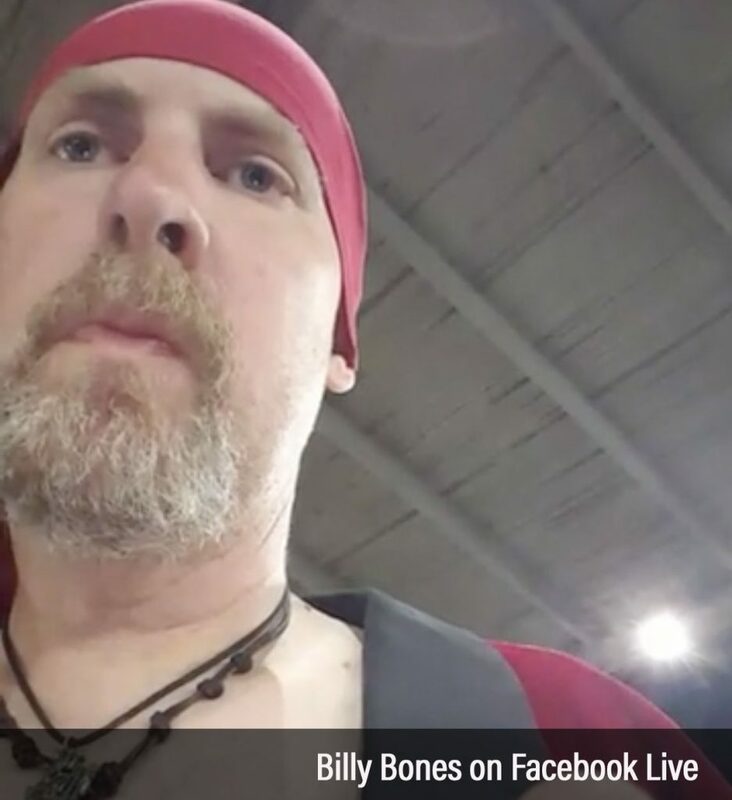 Defying expectations, Billy was in fact not completely drunk this year, which meant that he remembered to broadcast the proceedings live on Facebook! 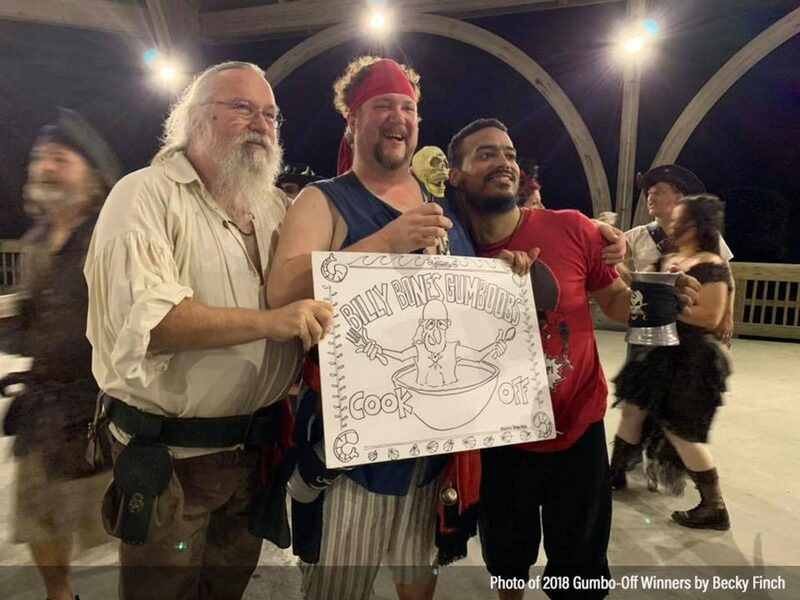 This year’s festivities began with a brand new event: The Billy Bones Gumbo Off – a gumbo competition that is sure to become very popular as time goes by. For its inaugural run the Gumbo-Off saw three brave entries which were met by three brave judges: Fred Steele, Lisa Wilson, and Wade Finch. The gumbos were brought to the judges in unmarked containers, and the gumbo tasting began! The judges began tasting their gumbo samples. There was a lot of nodding and grunting. Several judges got faraway looks on their faces. Wade and Fred exchanged questioning looks and Wade announced that it was “fishy”, but not in a bad way. When the judges caught a first whiff of this gumbo they began making excited noises. As they tasted the gumbo they began smiling and exchanging significant looks. The judges conferred and Billy Bones called out to bystanders to gather ’round to hear the winner. After a brief discussion the judges unanimously agreed that the winner was GUMBO #3, which belonged to Dan Garner, who many are now calling “Lord Gumbo”. This year’s runners-up were Ray McQuaig and Geoffrey Harrison, both of whose gumbos were soon devoured by the rest of the crew. 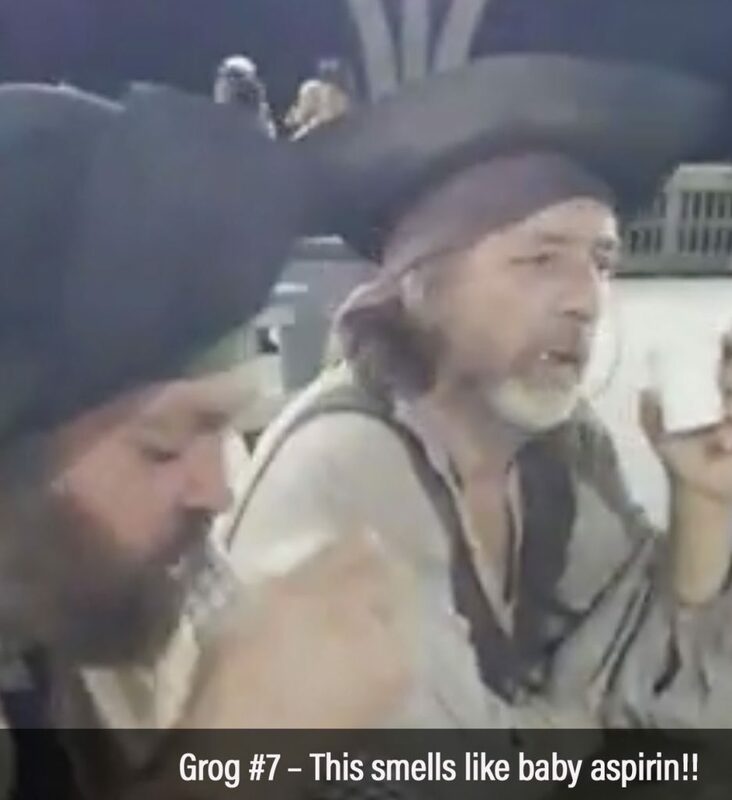 With the Gumbo-Off complete the ceremonies for the Third Annual Grog-Off in Tybee Island began in earnest, with Billy Bones lurching around the pavilion answering strange questions by random pirates, while Pogue Mahone sang All For Me Grog in the background. Scroll down to find out the name of this well-informed winner!! 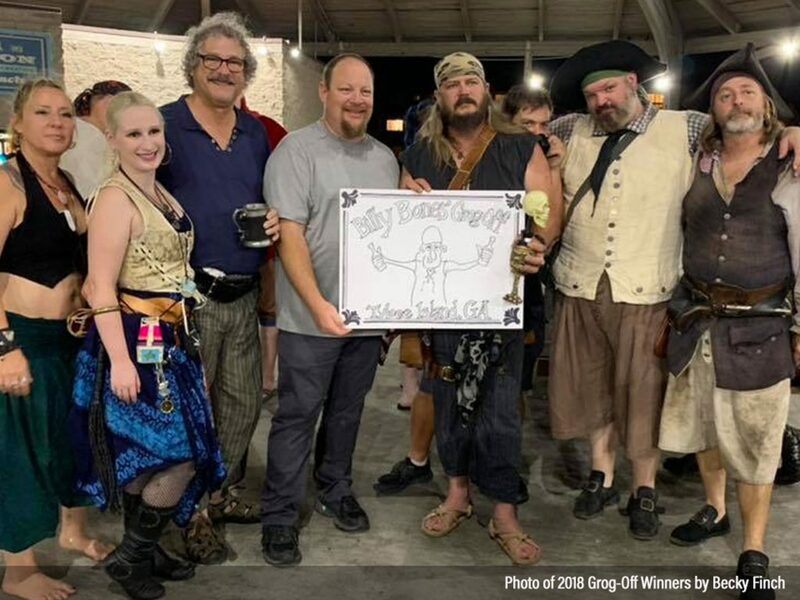 Since Billy was busy emceeing the event he relied on his Grog Crew to handle the logistics of getting each grog to the judges. Back at the grog prep station each bottle of grog was marked with a Billy Bones themed name tag prior to the commencement of the contest. 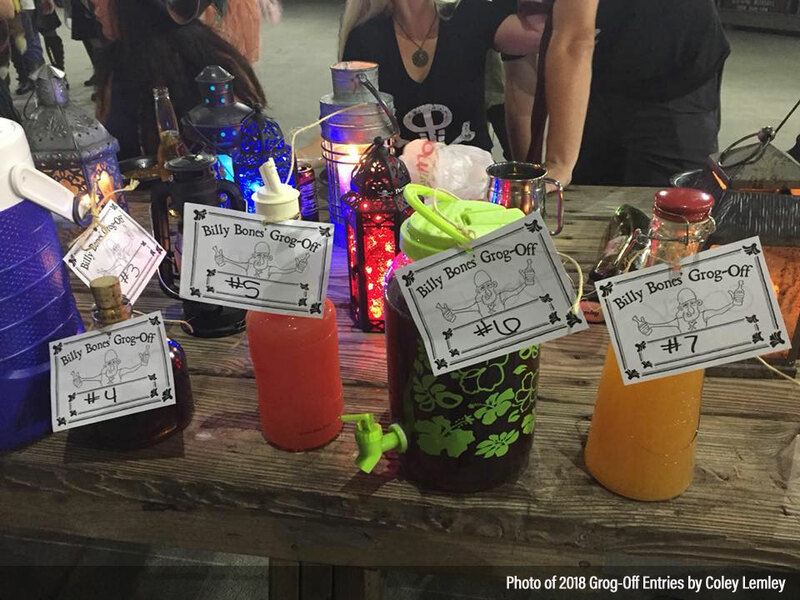 The Grog Crew carefully measured samples of each grog into cups and delivered the cups to the judges as requested. 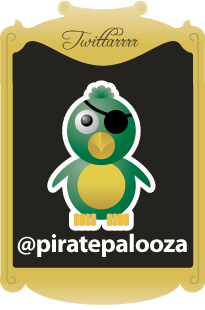 The judges immediately reacted to this grog’s aroma. Several judges pronounced this grog as being “very tasty”. Israel mentioned “Christmas” several times in a row, then began teaching Foe to say it. 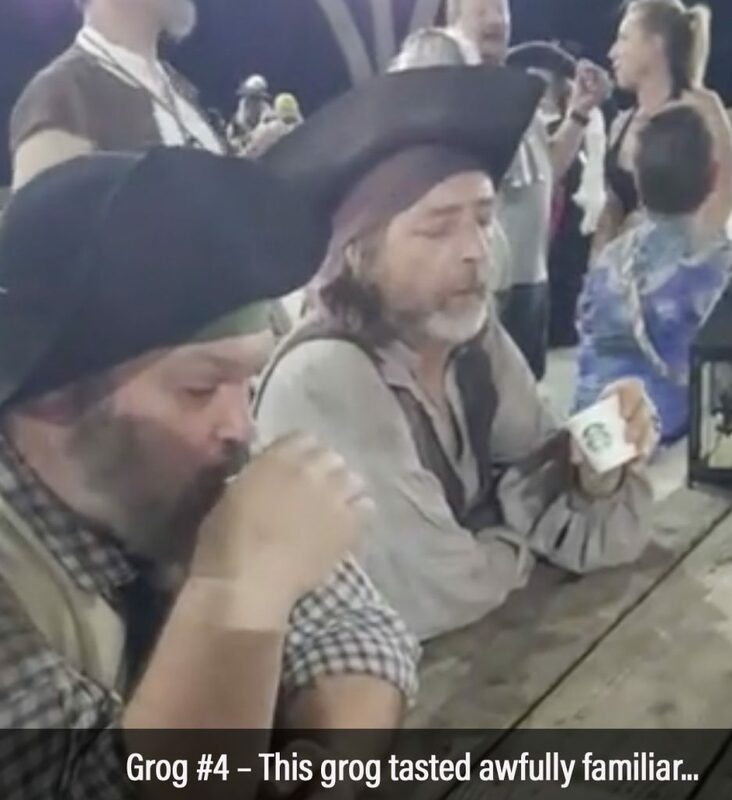 The judges looked very thoughtful as they sipped this grog. All the judges except Israel. 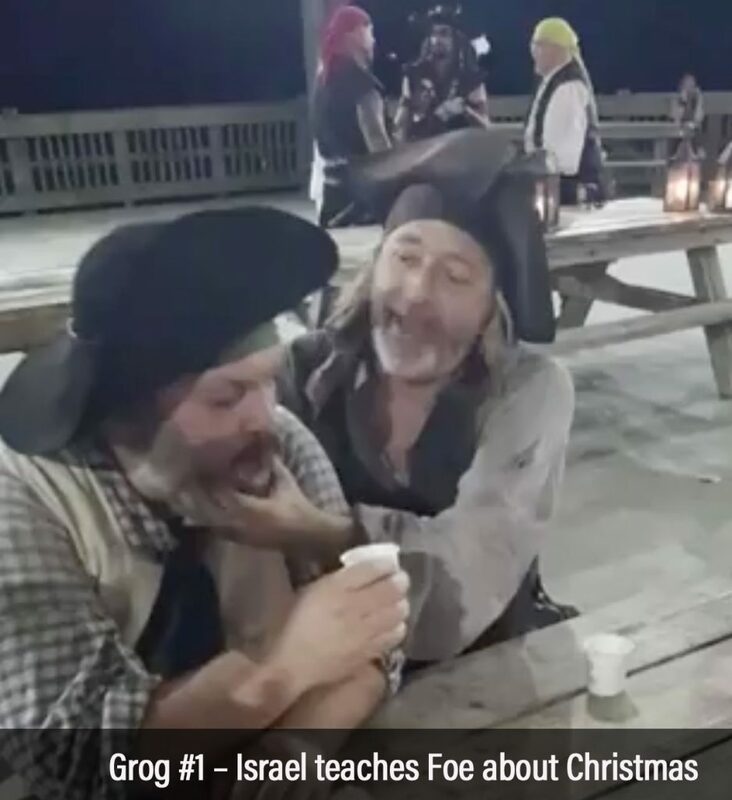 Billy Bones asked Israel what he thought and Israel replied that this grog tasted “familiar”. The judges sniffed at this rum for a while. Foe said it leaned heavily toward orange and pineapple. Wade said that it was “footy”, Foe suggested that it had “foot notes”, and the conversation turned toward corn chips and feet and regret. Israel ended by saying it was more of a rum punch. Foe was noticeably tapping his foot as he began tasting the first entry, he was clearly nervous. 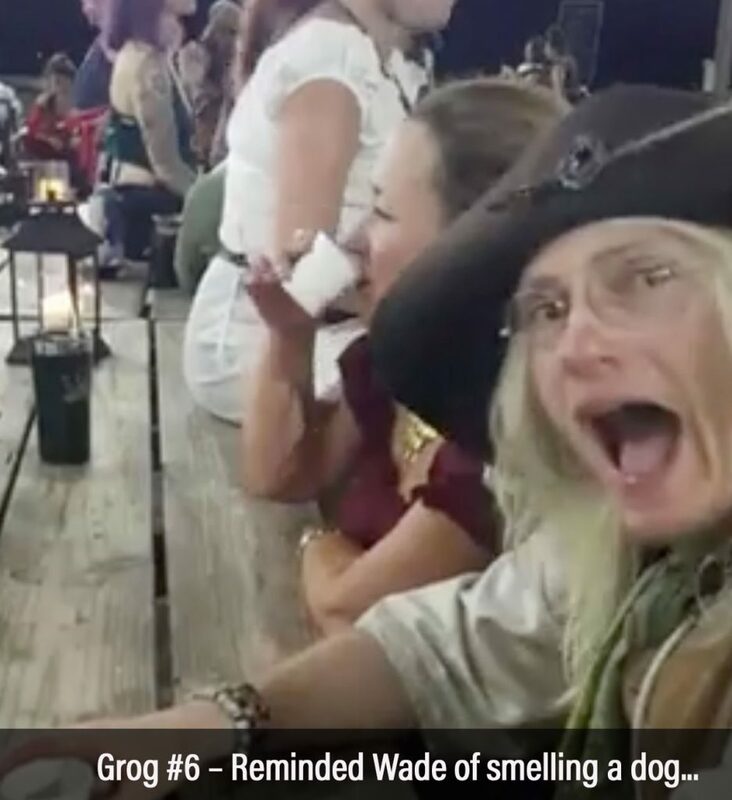 Wade yelped at the sugar content in this grog. 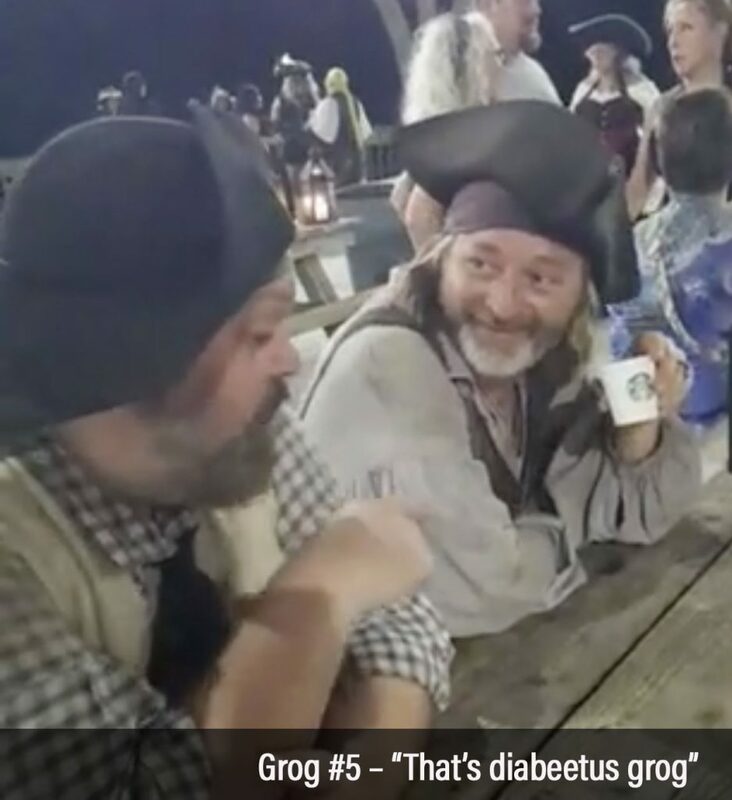 Israel pointed out that this grog was RED. His eyes flew wide open as he took his first sip. 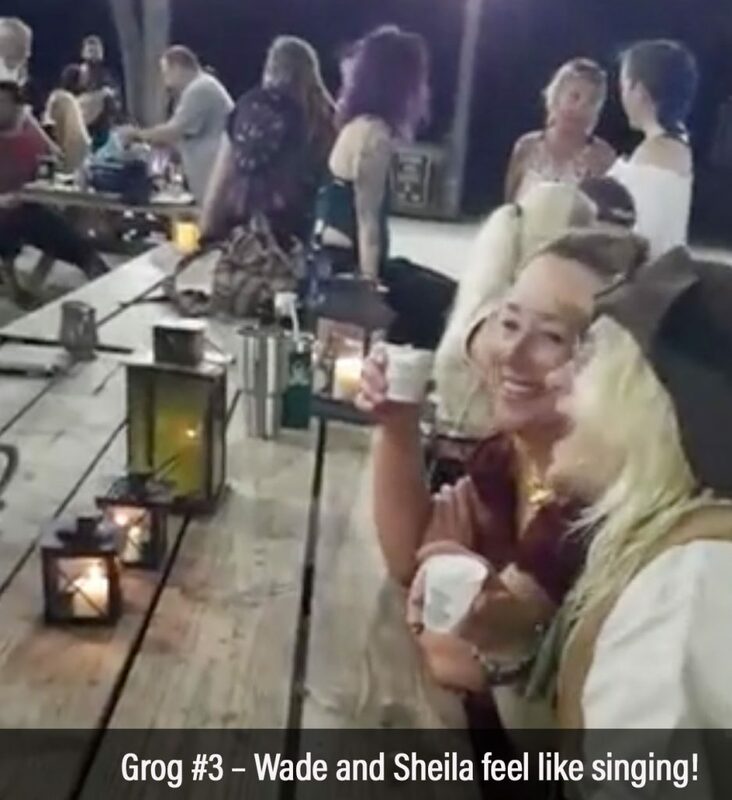 Foe, Wade, and Sheila handed their unfinished cups back over to the Grog Crew. Israel toyed with his a bit longer but didn’t finish it. The judges eyes lit up as they sipped this grog. The final grog arrived at the table. 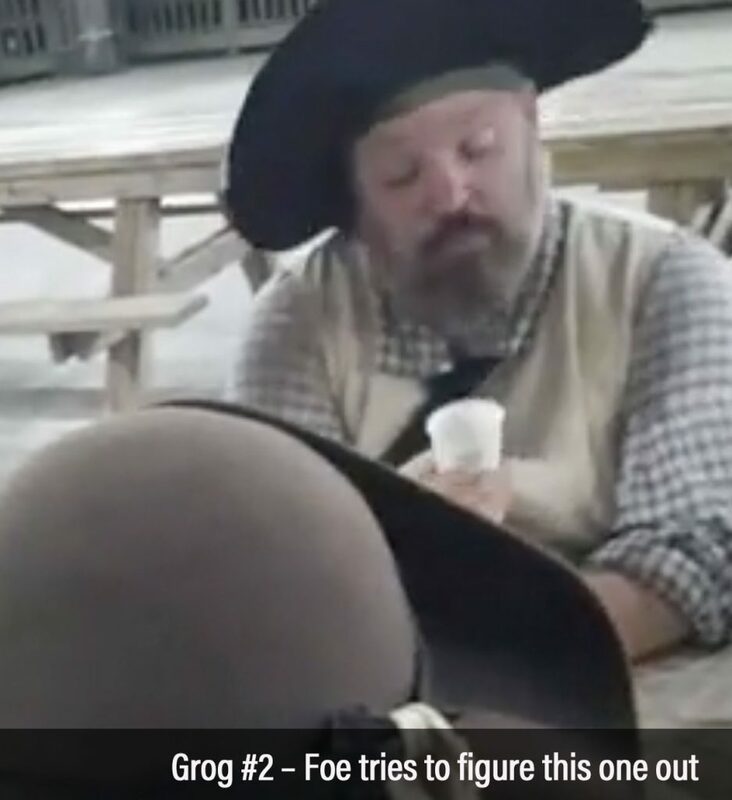 Foe and Israel took turns bobbing their noses toward their cups and exchanging looks. They detected a hint of lemon and ginger in the grog, and Foe called it “tangy”. There was so much flavor that several of the judges wondered if there was even any alcohol in it, but Israel quickly assured everyone that he could tell there was plenty of alcohol in there. They all agreed that this grog was in the top two. The Grog Crew brought over two small bottles, #4 was clear with an amber liquid inside, #8 was made of blue glass. The judges all agreed that they had a winner! James is no stranger to rum – he regularly shares very detailed reviews of rum to his wall on Facebook, typically accompanied by a history lesson. It speaks well to his knowledge of craft that James won this year’s grog-off!! Billy thanked the judges for their hard work and invited the gathered crowd to attend the awards ceremony and then try the rums for themselves. 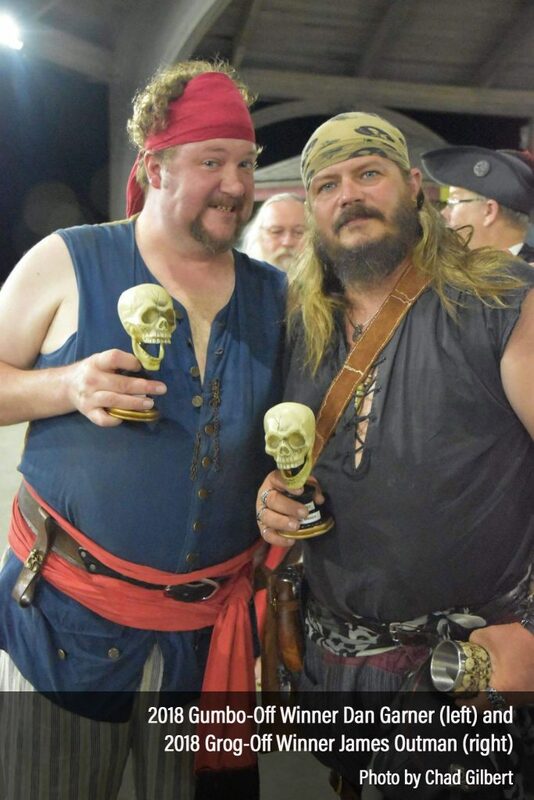 Billy Bones was excited to award 2018 “Bonesy” trophies to Dan Garner (for Gumbo) and James Outman (for Grog), treasures they will keep in their hammocks forever – or as long as it takes to trade them for rum. Note that this year’s records for the event were nearly lost to an outbreak of hangover fever, but thanks to Billy’s Facebook Live documentary our crack team of documentarians have pieced most of the puzzle back together. If you have any additional information you may reply to this post. Congratulations to all the winners, runners-up, judges, and audience members, and to Billy Bones for organizing this fun event every year! 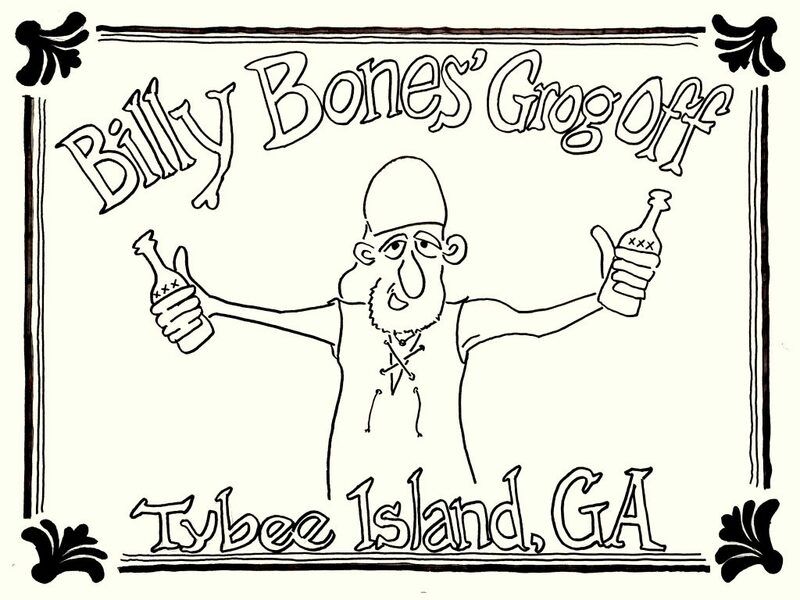 PiratePalooza wishes to congratulate Billy Bones for another terrific year of grog at the Tybee Island Pirate Festival! Thank you!! And congratulations again!